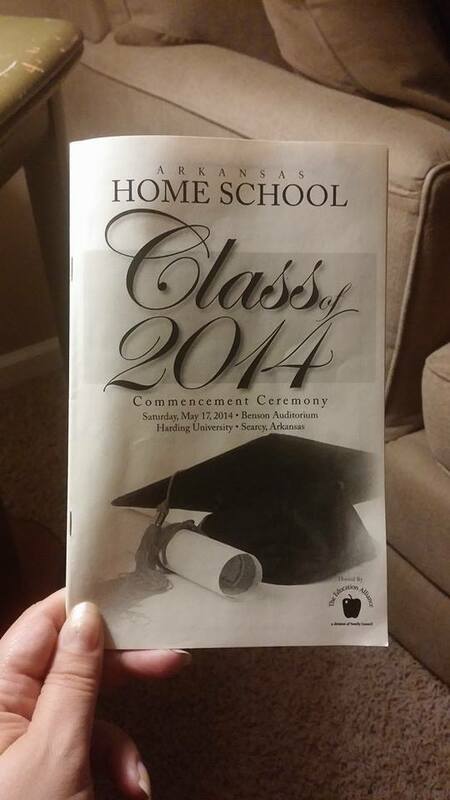 Last Saturday I had the opportunity, and the honor, to be the Commencement Speaker for the Arkansas Homeschool Class of 2014 Graduation. In addition to speaking, I also got the chance to hand out all the diplomas. What an privilege! I wore my “Dancing with the Stars” blue dress, because it looked “graduation like,” and I headed up to Searcy, Arkansas. Here is the program from the event. I wish now that I would have taken a few photos of the graduation, but I thought taking my phone on stage as I handed out diplomas might be a little tacky. There were 83 graduates, and I can’t even add up the amount of time, love, and prayers their parents put into their education. It’s always exciting as young people step into adulthood. And I know God is with them as they go! For a few weeks prior I prayed about what to share with the graduates. As I thought about the most important things that I wanted these graduates to know as they headed into life I realized that they centered on the theme, “The 5 Senses.” It might be an odd topic, but hopefully it was memorable! Here is my commencement speech if you are interested! Greetings graduating students, families, friends, and honored guests. Graduating Class of 2014, thank you so much for having me. What a honor to be here today. As a homeschool mom of six children, ages 3 – 24, I understand the hours of labor and of laughter represented here for both the parents and students. For some of you, your homeschooling journey started at birth, and you attend your first homeschool conference worn in a sling, clinging to your mother’s chest. For others of you, your journey was more recent. Perhaps even in the last few years, after spending most of your time in private or public education. I love homeschooling, it is among homeschoolers that I can say words like Abeka, Timberdoodle, Konos, and Apologia, and you understand me. You don’t think I’m speaking a foreign language. Or wonder if I have to sneeze. Students, I understand a bit of your educational journey, and it causes me to think back on my own. Twenty-five years ago, in June 1989, I sat where you are, a graduating student with many hopes and dreams for my future. I wanted to be a public school teacher, live in the same, small California town I grew up in, and have two children. None of those dreams came true. Not one of them. Not even close. Instead, as a homeschooling mother of six children, with over forty published books in print, I’ve discovered some things. A few that I’m going to share with you. As a writer, and a homeschooler, I prayed for a theme that would stick with you longer than the graduation cake that you’ll be having later, and as I jotted down the most important truths that I want to share, I realized that they all centered around the 5 Senses. We all know what the 5 Sense are—or if you don’t still nod and smile. Otherwise I might not be willing to pass over your diploma in a few minutes. Hearing, Sight, Taste, Smell and Touch. Let’s start with hearing first. Yet listening will get you far. Here are a few things to listen to. Listen to the praise and direction of others. Your parents and friends see your potential, perhaps in ways you can’t see it for yourself. Don’t be afraid to ask those who know you and love you, “What do you see me doing with my life?” Listening to those you trust may point you in directions you never expected. Listen to your heart. Think back to the childhood moments—the moments when you felt “more you” than any other time. Did you love to draw? To make up stories in your mind? To build? To help your mom in the kitchen? I spent childhood summers at the library reading books, checking out books, shelving books. Once I even wrecked on my bicycle, going down a hill, because the books hanging from my handlebars was heavier than me, and flipped me over them. Now, I write books—what a surprise. It’s a lot of work, but also a lot of joy because I’ve tapped into who God created me to be. Finally, listen so you will obey. The general concept of obedience in the Old and New Testament relates to hearing or hearkening to a higher authority. Strive to be know as a person who hears God and acts accordingly. “See what God is doing and join Him.” God is working in the world around you. He has a plan for you to fit into His work. Today, all around this country, there are other young men and young women graduating just like you. They are hearing messages like “Dream big!” or “Chase a dream that requires your effort and your passions.” Yet chasing something that you’ve devised yourself is a lot of work, with no guarantee of success. For me this has included helping to start a crisis pregnancy center, writing 40 books, adopting three children, and mentoring teenage moms. Part of my mess-ups became a message of hope to others. I’ve accomplished a lot in 20 years, but taping into God has been the key to my success. I watch for Him, like my little kids watch for the ice cream truck, and then run His direction when I see Him. I urge you to do the same. Life is going to harder than you’d guess, but it will also be more wonderful than you can imagine. Taste and see that God is good. Have you ever been to a supermarket that has given out free samples of food? They know if you try it, you will like it, and buy it. Get a taste of God. Seek Him like you’ve never sought Him before. Taste His goodness. You will want more of Him, guaranteed. Touch – This one is simple. In a world of virtual relationships, and lots screentime and selfies, remember to focus most of your time on those you can touch. Your family and your friends, and someday your spouse and your children. There are many wonderful people in this world. There are noble things to do and ways to touch lives. I’ve traveled the world, and I’ve spoken before thousands of people, but my greatest influence has been with those who can feel the support of my hand, and the warmth of my embrace. You are a person of influence. You are a leader to those who walk beside you and with you. Touch the lives of those closest to you first and most. The virtual world doesn’t need you as much as they do. Smell –How can I use smell to urge you on? With this: Be the Chanel No. 5—which is still one of the most expensive and popular fragrances in the world—instead of being Dollar Store body spray. A Christ-fragrance will be appreciated by those who know and love God. A Christ-fragrance will be a stench to those who live for themselves and their own pleasure. It’s okay to stink up this world, graduates. You will be a stench to those who have turned their backs to God and who are seeking the world’s pleasures instead of trying to please God. Go forth and stink with boldness … because in doing so your Christ-fragrance will be a pleasing aroma to God. So what is my prayer for you, according to the 5 Senses? I pray that you might stink to the world, for that means you’re a sweet aroma to our Lord. I pray that your computer will crash at least once, and that you’ll be close to losing that important college paper, so that you’ll remember that the real people in your life—those who you can touch—matter the most. I pray that hard days (but not too hard) will come, forcing you to taste of God’s goodness. In your greatest need, Jesus will fill you with Himself. I pray that as you look for it, God’s work around you will be seen, glowing like neon on a dark night. And that you’ll have faith enough to step out and join Him, no matter the cost. Finally, I pray that your ears will be tethered to you heart, and that you will discern your natural giftings and the wise advice of those who know you and love you, to launch you on the right path. But even more, that you will hearken to a High Authority and act accordingly, so you will be saved from the heartache and pain that our own desires bring. Finally, just as God gave us the 5 Senses to connect us to the world around us, I pray that you may truly understand the true worth of God in your life. Which leads to one final story. Two stolen paintings by the French artists Paul (Go-gan) Gauguin and Pierre Bonnard hung on an Italian factory worker’s kitchen wall for almost 40 years – without his knowing just how valuable they were. Worth millions of euros, the artwork was stolen from a family house in London in 1970 and then abandoned on a train. After being found on the train, the paintings were put away in the Italian Railway’s lost and found storage facility. At a lost-property auction in 1975, an unsuspecting Fiat worker paid 45,000 Italian lire for them – roughly equivalent to 22 euros ($30). The man was an art lover, but he had no idea of the real value of the paintings. The man, whom police did not name, hung the works in his Turin home before taking them to Sicily when he retired. Italian heritage police were alerted last summer when a friend of the worker grew suspicious of their value. 30 Million! The Italian factory worker had priceless art hanging in his kitchen and didn’t realize it. Your education and upbringing have given you a priceless gift. During your last 18 years, the knowledge of God may seem nice—like something you can hang in your kitchen. Instead, I hope you come to understand that all you carry within—this knowledge of God that your parents imparted into your hearts—is priceless—of greater value than you’ll ever realize. Worth more than a Paul Gaugin painting. 30 million doesn’t come close to what walking with God is worth. So today, graduates, may you use your 5 senses to become all God has created you to be. And may it someday be said that your generation impacted the world in ways no one expected, for the glory of God. May you life find true value in Him, through Him, and for Him. To God be the glory! So congratulations! Go forth and make a mark in this world. And while you’re at it, don’t forget to buy your mother a new set of measuring cups. After all, hers have served your science projects well. Thank you. What an absolutely inspiring commencement address! Thank you so much for the reminders of truths that never change. I will make certain my grandgirl who is graduating from public school this year reads this. She will hear nothing like this at her own graduation! Thank you so much, Phyllis!! I hope it’ll be a blessing to your granddaughter.